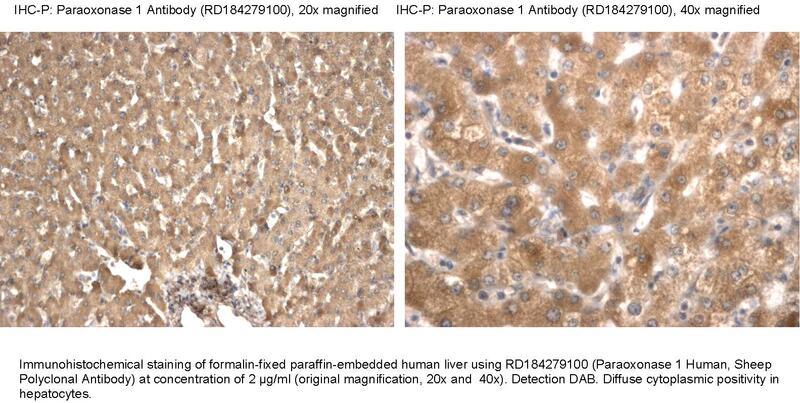 The antibody was raised in sheep by immunization with the recombinant Human Paraoxonase 1. The immunization antigen (40.68 kDa, calculated) is a protein containing 355 AA of recombinant Human Paraoxonase 1. UniProtKB acc.no. P27169 (Met1-Leu355). C-terminal His-tag (7 extra AA). (highlighted). Immunoaffinity chromatography on a column with immobilized recombinant Human Paraoxonase 1. PON 1 Hydrolyzes organophosphate substrates and lactones, and a number of aromatic carboxylic acid esters. It is found in plasma associated with HDL. It mediates an enzymatic protection of lipoproteins against oxidative modification and thus against atheroma formation. Genetic variation in PON1 is associated with susceptibility to microvascular complications in diabetic patients.